It wasn’t until I had been in Abu Dhabi for almost a full day that I truly realized just how far I had traveled to be there. It was just about to be 5:00 am and despite the fact that I had to be at a meeting in four hours, I hadn’t slept all night thanks to jet lag. My boss had warned me against sleeping on the plane but I had a full time job, a toddler, and was going to grad school at the time – I closed my eyes about thirty minutes into the flight and didn’t wake up until we were over Istanbul. I remember that first night in the hotel – laying alone in a king-sized bed (secretly enjoying how clean the three-room suite was compared to my apartment back in New York) when I heard it; the crack of static over a loud speaker and then a man’s voice, singing one of the most beautiful melodies I have ever heard. I don’t speak Arabic but as I listened to the syllables, the notes of the melody sliding back and forth a quarter step at a time, my soul was moved – deeply. Suddenly feeling even more awake, I scrambled for my iPhone so that I could record the Muslim call to prayer. The only thing I can remember thinking is “I’m in the Middle East” – and somehow that felt like a profound revelation. Later in the week I traveled to the Sheikh Zayed Grand Mosque (dressed in a black abaya and hijab), another day I stood on top of a sand dune looking out on nothing but desert as far as I could see, but I didn’t feel that same stirring sensation again. Because I was traveling for work, the majority of my time was spent in meetings, at company meals, and touring our Abu Dhabi facilities. Whenever I had the chance I would stop by a local bakery or ask about the regional cuisine. I asked several times what restaurant I should visit for an “authentic” meal, and each time I was met with the same perplexing answer – there are no restaurants serving local food; how about Lebanese instead? I don’t know if it was the sweltering heat, my exhaustion from trying to adjust to the massive time difference, or the crushing blow that I wouldn’t taste “authentic” local fare (at least not on this trip) but I felt myself give up in that moment; I stopped looking for ways to experience the culture in Abu Dhabi. Despite the overwhelming kindness of the local people and the breath-taking beauty all around me, the rest of my trip passed with very little worth writing about. Nine days after I first heard that call to prayer, after I had felt truly and fully immersed in an unknown culture, I packed my suitcase harboring little more than real Arabica coffee, dried dates, and a plastic Camel’s Milk bottle (now filled with sand from the dune I had climbed in the dessert), to remind me of what I had experienced in the UAE. Once aboard the plane I stowed my carry-on and prepared to recline my seat for another 13-hour nap. The flight attendant came over to me and offered me a drink. I don’t know why I bothered to look at the menu; I never order anything other than water. But then I had a thought. I had been so wrapped up in trying to find a life-changing cultural experience through cuisine that I had failed to try something that is available everywhere in Abu Dhabi (and that had been explained to me by many as the unofficial drink of the Emirate); I had spent more than a week in the UAE and hadn’t sipped a single Lemon Mint. The flight attendant stared back at me, patiently waiting for me to resolve what I am sure she sensed to be some strange personal dilemma. I smiled and heard myself say, “I’ll have a Lemon Mint, please.” And, a few minutes later I was sipping a thick, syrupy lemonade-like beverage (speckled with tiny green pieces of mint) that was surprisingly, not that sweet. The pale yellow drink was beautiful and refreshing and it made me realize that my trip had been as well. Much like the lemon mint, I had waited too long to discover that truth. 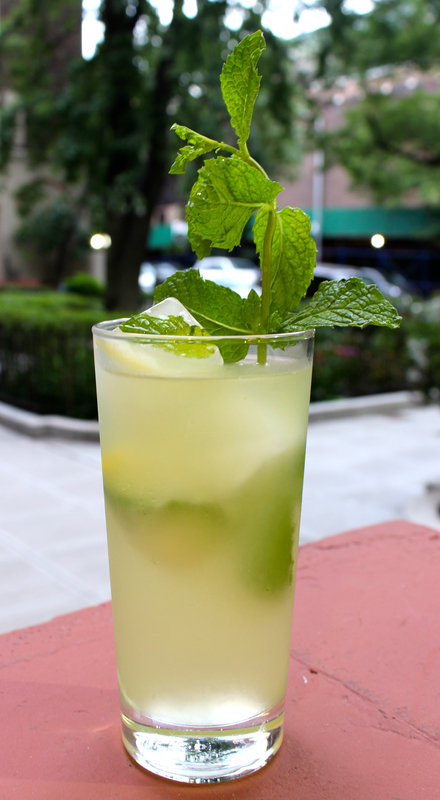 Back in New York it was impossible to find anything like the lemon mint. The minted lemonade in the States is thin, exceedingly sweet, and inexplicably underwhelming. I scoured the web for recipes, none of which resembled the version I had tried on the airplane. This past Wednesday was extremely hot – more than 90 degrees Fahrenheit. I left my office in the Flatiron district of Manhattan wearing a pair of tight-fitting, dark-colored jeans – the heat was oppressive and I was sweating almost instantly. I stopped (facing north on Fifth Avenue), looked at the people rushing past me, and had a revelation; tonight (two and a half years later) would be the night I would finally re-create the Abu Dhabi Lemon Mint. The weather was perfect, my desire for something simple and meaningful amidst the commercialism and anonymity of Manhattan life was perfect, the huge bag of lemons sitting in the produce drawer of my refrigerator at home was perfect…it was meant to be. Tonight was the perfect night, not only for a Lemon Mint, but for an Abu Dhabi Lemon Mint – something to remind me that if you’re always looking for the extraordinary in the most obvious places, you’ll often miss it entirely. Put the sugar in a small saucepot with 1 cup of water. Bring the syrup to a boil and let it simmer for a few minutes until it has thickened slightly. Remove the pot from the heat, put the mint into the hot syrup (reserving a few sprigs for garnish if you’d like) and let the syrup sit until fully cooled. Once cool, remove the mint and store the syrup in the refrigerator in an airtight container. When the syrup is done, juice the lemons. You should have about 1 cup of fresh lemon juice. 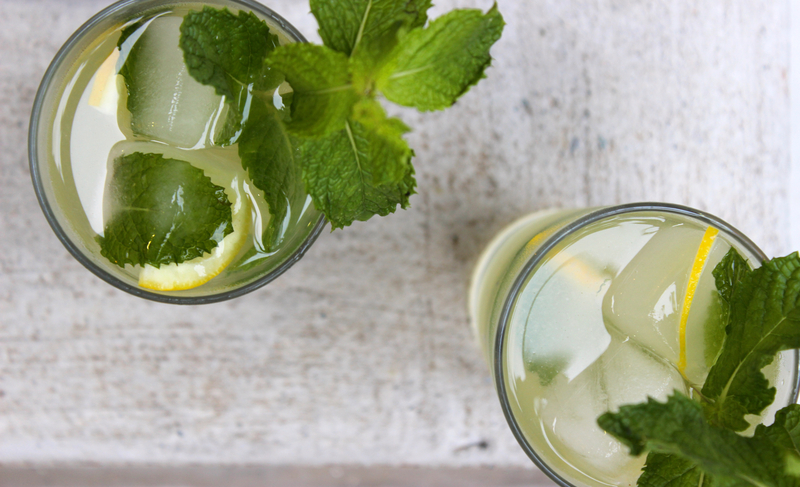 Mix the drink by combining equal parts of the freshly squeezed lemon juice, the mint syrup, and cold water. 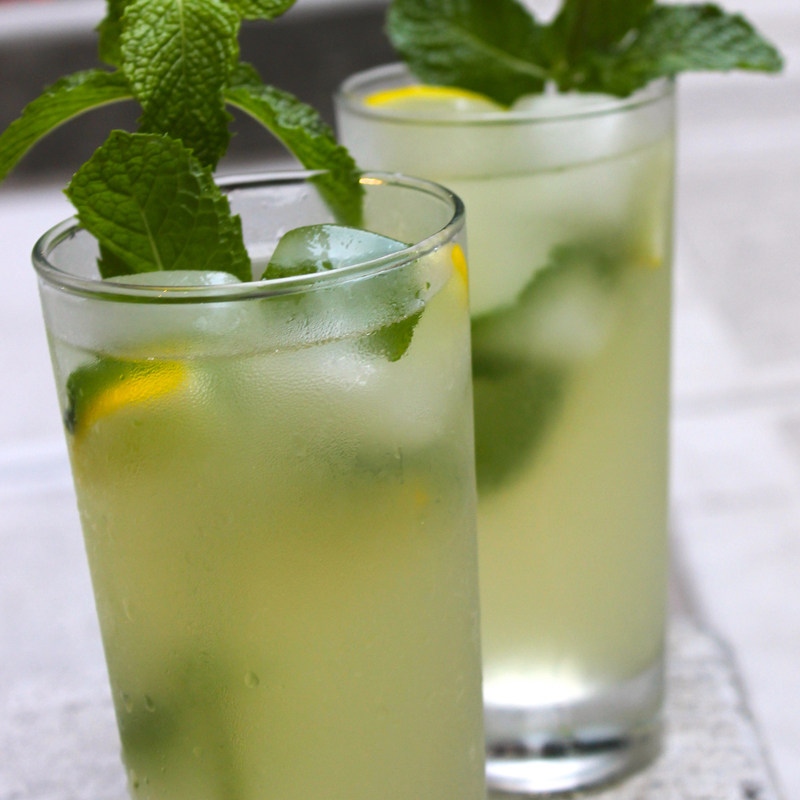 Serve the drink over ice, garnished with large sprigs of mint. You can add even more flavor to the drink by making lemon-mint ice cubes; simply place one mint leaf and a small slice of lemon in each compartment of an ice cube tray, fill with water, and freeze.